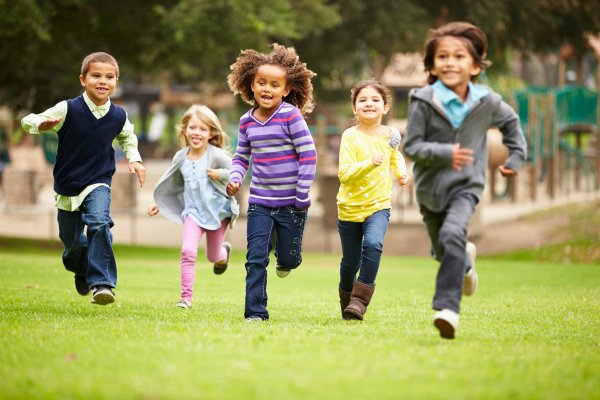 Going outside is a MUST, kids need fresh air and space to run and be loud in ways that they can’t inside. From time to time my co-teacher and I will play an organized game with our students during outside time but most of our time is spent in free choice. Just because it’s free choice doesn’t mean it’s time to grab your phone and check Facebook. It’s time to engage with your students and connect on the playground. Teaching preschool is much easier and a heck of a lot more fun with a connected class. Children who are eager to please, children who trust you to guide and care for them, and who want to listen to you because you listen to them will be a pleasure to teach. Most of the time you are outside you can just take their lead following along with their child-led play. But sometimes you will get a child who is overwhelmed, unable to break into pre-existing play groups or simply bored. Other times outside play may get out of hand, and you need a way to re-group your class to get back on track. A little intervention can go a long way, and free choice can resume. 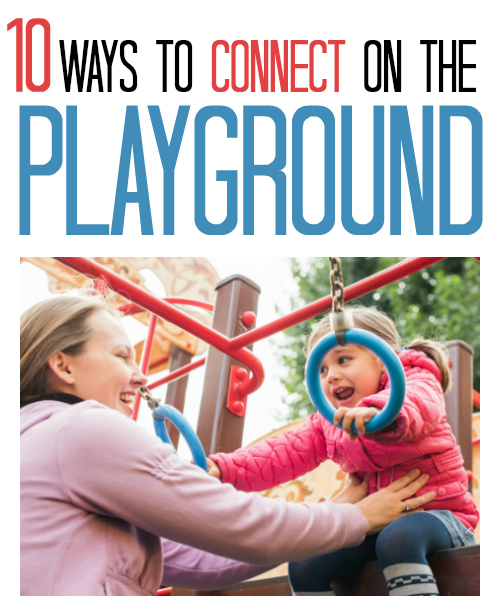 Here are some simple ideas to play and connect on the playground. To encourage climbing the climber and zooming down the slide I situate myself near the end of the slide and give excited high tens to the sliders after they zoom down. I don’t announce a thing I just start doing it and bam that bored kid in the corner eyeing the huge stick the climber is climbing and zooming down the slide with a huge smile. Simple right? It gets kids climbing and working on their coordination! Find a special rock. Our playground has pea gravel and when I notice someone chilling out alone I will ask if I can join them, sit down and start examining rocks. This is another great way to connect on the playground because it’s never long before a few others have joined in and my pockets are filled with special rocks. While we dig we often chat and when you chat you connect and model vocabulary! Please don’t forget to ask if you can join them because sometimes they are simply trying to get a minute of alone time and as teachers, we need to respect that need for space. If you don’t have rocks, you can look for leaves, acorns, or pinecones! Drive-Thru. A playhouse or a climber can be the drive-thru window, and everything else can be imaginary. 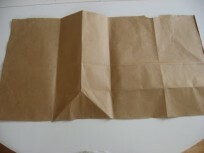 Children love this game and all you need to do is place and order, and they jump into their roles. Our drive-thru is usually an espresso stand, but that’s what you get in the Seattle area, yours can be anything! Color Hunt. This works wonderfully when the whole group needs a quick re-set. Call out colors and have children run to them. Call out a new color and continue. To get kids moving and burning energy we LOVE to play catch Ms. Allie. I just run, and they follow, this is a favorite. Yes, it’s that simple. It’s a great way to burn off extra energy. And what better way to connect on the playground than chasing the teacher! Play pass with little balls. I don’t think I have played pass for more than five minutes with my students because my place gets taken by another student soon after we start. Remember preschoolers are transitioning from parallel to social play. It’s our job to help model how to ask a friend to play. In my experience, students want to play together but aren’t always sure how to make it happen. Sidewalk Chalk. Writing and literacy are not just inside activities! 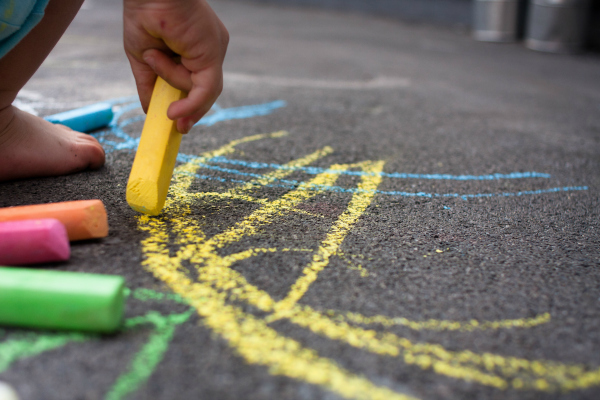 Draw, make chalk roads, write names and more with sidewalk chalk. I will usually just start drawing, and that will be enough of a prompt for a few observers to grab some chalk for themselves. Then I can ask them about what they are creating, and that becomes a great connection point. Get on the climbers, yes YOU. Students think it’s magical when you get on the climber or slide down the slide. As long as it is safe to do so, there is no reason you can’t. Help the timid child to see it’s OK. Get up there if a child is rough and talk quietly to them instead of yelling from across the playground to be gentle. Or my favorite climb up and pretend to be a pirate with your class. It’s OK to be playful when children feel connected to you; you don’t need to be a stone cold authority figure to have control of a class. Red Light Green Light. Oh, I love this game, I love how it teaches self-control, I love its ability to burn off energy, and I love the giggles it creates too. You don’t need a huge space for this game and it’s fun to play with the whole class or a small group. Sandbox. The sandbox always seems like a pain to deal with especially if it’s at all wet. But I feel like the conversations that happen in the sandbox are the best outside. This is a great way for kids to connect on the playground. 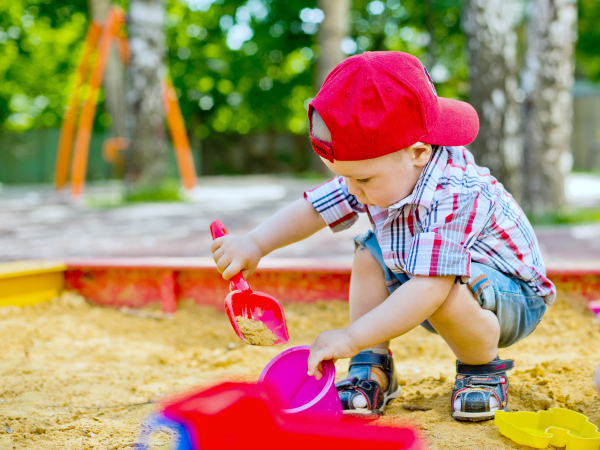 Much like playdough’s ability to get kids chatting in the classroom, the sandbox gets kids conversing outside. One of the greatest gifts we can give our students is a rich vocabulary. And that doesn’t happen when we stand in the corner and catch up with our co-workers the whole time we are outside. It happens when you sit with a child and talk with them, not at them. That’s our job, and a sandbox is a wonderful tool for that! How do you use outside time in your classroom to connect with your students? I’d love to hear all about it! Comment below, or come join me on Facebook and leave your suggestions there! Next Post: Easter Books For 3 Year Olds – 15 Great Titles. That article is such a blast to read! All those activities are fun to read but even more fun to do with the children. Instead of observing children engaging in playing with each other or even trying to disengage from a group and have fun alone, it is very helpful to connect with them by getting in touch with our inner child. It is when the children will feel that you are not there as an authority figure but more of a caretaker. Keep it up with the great work!